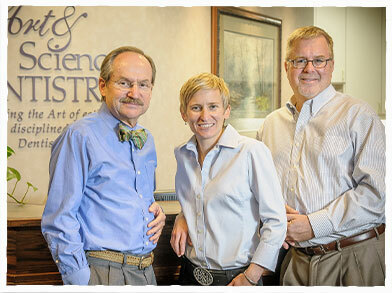 Welcome to Art & Science Family Dentistry! Here, we focus on balancing the art of esthetics and the disciplined science of dentistry. Our skilled dentists and team are pleased to offer a wide variety of high-quality dental treatments, including preventive care, general and family dentistry, restorative treatments, and cosmetic dentistry. No matter your dental needs, we are certain to have the treatment you need for a smile that is both healthy and beautiful for life. With services ranging from Invisalign® and teeth whitening to dental implants and root canal therapy, we are here to help. For more than 40 years, our team has proudly provided excellent dentistry in Woodbury, Minnesota, and we are also happy to welcome our friends from the neighboring areas of Oakdale, Cottage Grove, Maplewood, Hudson, Afton, and West Lakeland, Minnesota. Dr. George J. Kinney, Jr., Dr. Thomas J. Musser and Dr. Renee M. Kinney strive to make your care as gentle as possible, and they strive to remain current with the latest dental advancements. To ensure that your care is efficient, we proudly utilize digital x-rays, a 3D digital scanner from 3M, a laser caries detection system, and intraoral cameras. If you would like to learn more about our dental care, please feel free to contact us today. We take our job seriously, and we enjoy taking care of our patients. We are excited to hear from you!